It's not easy to see, but adding numbers to the Michigan helmets has taken the uniform to a new level this season. First of all, I hope everyone enjoyed the New Year’s Day bowl games, even if they did come a day later than usual. Today, we’ll look into the Big Ten’s uniform rankings, where tradition reigns supreme. The Wolverines have always had a classic, yet intricate look, but this season, they added a new feature that took the uniform to the next level. The addition of small numbers on the helmet to go along with the Wolverine claws is quite cool. The home combination of blue and yellow is always a good look with one dark color and one light. 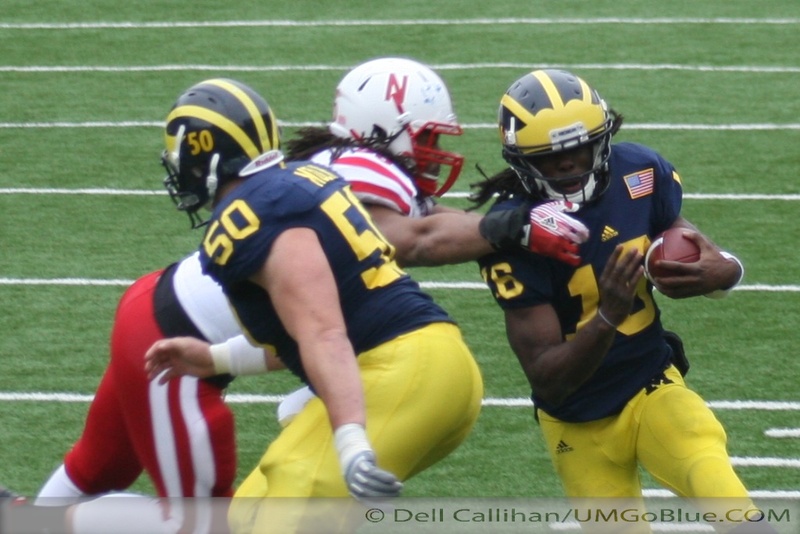 Also, those colors are synonymous with Michigan considering all the success and tradition in Ann Arbor. Again, the best part of these traditional uniforms comes in the details, but it is nothing new. The Buckeye helmet stickers given out by the coaching staff makes an otherwise plain helmet an interesting part of the uniform. Again, just like the Michigan uniforms, the colors of Ohio State (scarlet and grey) are iconic in college football. The Illini don’t have the same tradition as some other Big Ten schools, but again, the combination of orange and blue works for me. The recent addition of some unnecessary trimming along the jersey bothers me a bit and the logo of “Illinois” with an underline is a little boring, but overall, the look is stellar. While, the uniform might be very generic, and as my brother said, “a typical uniform for a team that wears white and red,” it is still aesthetically pleasing. The big W on the helmets fills enough of the helmet to make it cool, and the red trimming along the white pants makes the uniform work. These are the most classic or classic football uniforms. The Nittany Lions wear blue at home and white on the road. It’s that simple. If Penn State did not have any success, these uniforms would be considered boring, but now they are iconic. 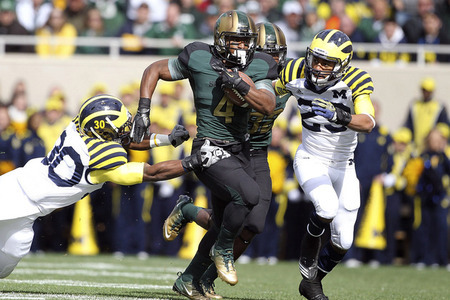 Michigan State and Michigan made the biggest uniform splash of the Big Ten season in October with these two uniforms. There’s a little bit more going on here for the Spartans. They have switched back and forth on their helmets over recent years, but the general combination of green and white has stayed consistent, save for one game against Michigan this season. 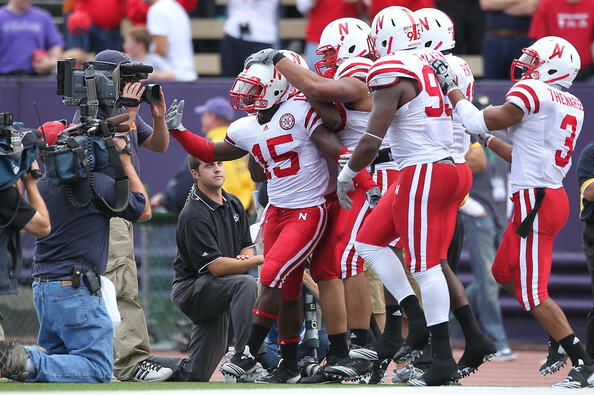 It’s still weird to include the Huskers among the Big Ten, but might as well get used to it. These are basically the same as Wisconsin’s uniforms, the only difference, the N on the helmet is small and they wear red pants on the road. The Wildcats don’t have the tradition of most of the schools in the Big Ten, and they wear purple, so there’s that. Nothing too special here. The Boilermakers made a change to their uniforms this season (gold numbers) along with most Nike teams, but it didn’t make the uniform any more special. The Hawkeyes look like the Pittsburgh Steelers, but with the logo on both sides of the helmet. It’s not bad, but not that creative at all. The Gophers have never really been any good. They wear maroon with yellow. It’s an all right look, but the addition of lots of trimming along the jersey has made it complicated in recent years. It feels like the Hooisers have tried to create a traditional uniform for years now, but have never been able to find the right combination. They also use a darker red than their basketball team, who has excellent uniforms.